In this video, Jennifer Bridges, PMP, discusses ways to get the most out of timesheets data for better reporting and project delivery. Timesheets, as Jennifer notes, are more than they seem. They are multiple uses for these forms and you probably were surprised to see how adaptable they are to project management.To summarize, the following are seven of the surprising uses for time sheets that Jennifer explained in the video. If you still need convincing why timesheets are your friends, then read Elizabeth Harrin’s love letter to these versatile and efficient forms in her article Why You Should Love Timesheets. Pro-Tip: Timesheets may surprise you with their ability to apply to other aspects of your project, but don’t forget that they’re fundamental in serving as a means to submit client invoices, determine individual workloads and build an historical database. Today we’re talking about seven surprising uses for time sheets. But before we cover those, we want to talk about the non-surprising ones—the ones you know as a project manager. They’re needed to submit client invoices. They’re also used to determine individual workload, and it’s also used to build a historical database for your future projects. Number one, by tracking the time on a project and seeing how people improve their work and seeing how efficient they may be, it may qualify them for another new project, a separate role or maybe even a new job. It could highlight someone’s expertise. When looking at time maybe over this project and over future projects, you could see where someone’s developing a certain expertise that you could utilize them for other specific projects. You can use it to identify training needs. If there’s a trend for a certain individual who is always taking more time than allocated or estimated on a project, you may see that they need some additional training. It can also measure the efficiency of your project or your process, somewhere where you need to go in and modify a process for your project. 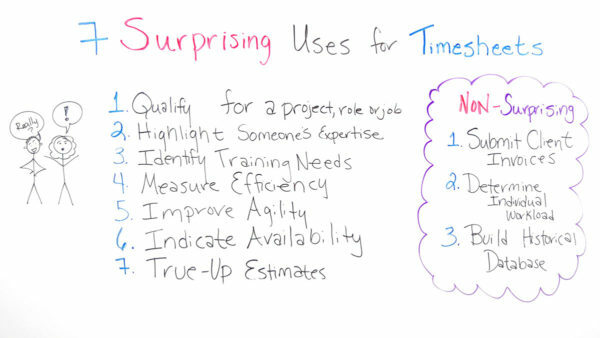 It can also help improve agility of your project where if you see once you start tracking time for your timesheet, again, it can help you become more agile on your project. It can also indicate availability. You’ll begin to see where maybe some of your resources have completed their tasks and activities. They may be available to assist some of your other team members or they may also be available to be reassigned to another project. Again, they can also help you true-up estimates for your project, for the remainder of that project as well as future projects. So if you need a tool that can help you with your timesheets, then sign up for our software now at ProjectManager.com.